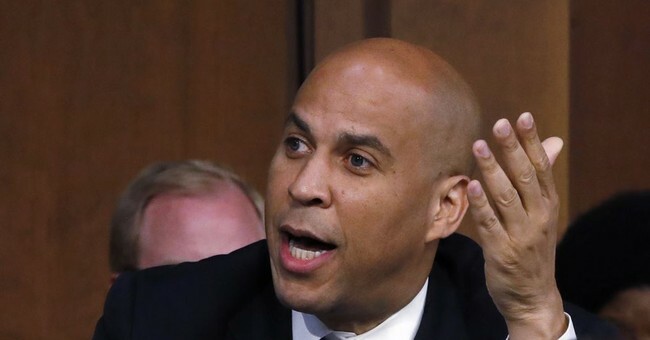 New Jersey Sen. Cory Booker injected chaos into Judge Brett Kavanaugh’s Supreme Court confirmation hearing Thursday by releasing confidential Kavanaugh emails with the backing of fellow Democrats in possible violation of Senate rules, calling it an act of “civil disobedience” and drawing condemnation from the Republicans on the committee. After announcing plans to do so, Booker released 12 pages of emails -- which had been marked "committee confidential" -- online for the public to read. The emails included internal post-9/11 discussions surrounding issues of racial profiling. The New Jersey Democrat said he would “knowingly” violate the Senate rules to release the emails. Some of the other Democrats on the committee expressed their support for Booker's effort. The fury over the documents led to a letdown for Democrats. The documents only demonstrated that in 2002, soon after the 9/11 attacks, Kavanaugh was against the racial profiling of people while working for the Bush White House. Kavanaugh told colleagues in the email that he favors “effective security measures that are race-neutral” for airports, and he is against “race-based” remedies for law enforcement in the aftermath of the attack. - Booker violated rules last pm b/c "racial profiling" email was then confidential. - He then requst'd permiss. for it to be public. - Committee + Bush team cleared it overnight. - So was NOT violation this am. Brett Kavanaugh didn't want to racially profile people after 9/11. Someone get Sen. Booker a tissue, his nose is bleeding from that rake he just jumped on.